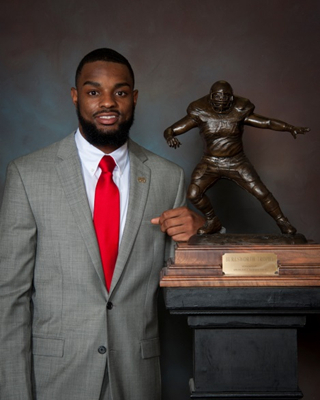 FAYETTEVILLE, Ark., Dec. 8, 2014 – Monday, senior wide receiver Justin Hardy from East Carolina University was named fifth winner of the Burlsworth Trophy in Springdale, Ark. at a ceremony hosted by the Springdale (Ark.) Rotary Club. The award is given to the nation’s most outstanding player who began his career as a walk-on. On hand to present the trophy to Hardy was ESPN’s Holly Rowe and Marty Burlsworth, founder and CEO, of The Brandon Burlsworth Foundation. The Burlsworth Trophy Presentation ceremony was held at the Northwest Arkansas Convention Center. Chuck Barrett, the “Voice of the Razorbacks,” and Kevin Trainor, Director of Sports Information, University of Arkansas were among some of the speakers at the banquet. Hardy has amassed more catches than any player in the NCAA’s Football Bowl Subdivision history. He enters the final game of the regular season with 355 catches for his career at East Carolina, breaking the record of 349 previously set by Oklahoma’s Ryan Broyles in 2011. Hardy ranks fourth in the country with 89 catches this season and has 1,106 yard receiving with seven touchdowns. Last season Hardy started all 13 games and was named as a Burlsworth Trophy semifinalist. He finished with 114 catches for 1,284 receiving yards, both school records. Hardy was named as an All-Conference USA selection. Fayetteville State, an NCAA Division II school in North Carolina, was Hardy’s only scholarship offer out of high school. He walked-on at East Carolina in January 2010 and after a redshirt season began to establish himself as a freshman, earning Conference USA All-Freshman Team honors from Phil Steele on his way to a record-setting career. Other finalists for the award were Mississippi State guard Ben Beckwith, and Iowa running back Mark Weisman. Beckwith, a versatile offensive lineman, plays both left and right guard for the Bulldogs. He can also line up at center for Mississippi State, which enters the final weekend of the regular season ranked No. 4. Beckwith’s plays on the offensive line has helped the Bulldogs amass an SEC-leading 511.7 yards per game with 39.0 points per game. Beckwith was lightly recruited and not rated by any major recruiting publications out of Benton (Miss.) Academy, a Class A private high school, but has been a fixture on the offensive line the past two seasons. The 2014 season finale will be Beckwith’s 24th consecutive start. Beckwith, who earned a scholarship last season, was offered a walk-on spot after coaches watched him in a summer football camp. He has been named the SEC’s offensive lineman of the week 3 times. Weisman has 14 rushing touchdowns in 11 games for the Hawkeyes this season, a total that ranks No. 15 in the country and fifth-best all-time at Iowa. He is just the third player in Hawkeyes history to score 30 touchdowns and is leading the team in rushing for a third consecutive year. As a junior Weisman led the team with eight rushing touchdowns. He also scored eight rushing touchdowns as a sophomore in 2012. He is one of 10 players in school history to eclipse 2,000 rushing yards in a career. Immediately after senior high school season in which he ran for 1,657 yards and 22 touchdowns as a senior, Weisman enrolled at the Air Force Academy. He withdrew as a freshman and enrolled at Iowa where he has gone on to become one of the top-scoring running backs in school history. Weisman earned a scholarship in Spring 2013. The trophy is named in honor of Brandon Burlsworth. Without one D1 scholarship offer, Brandon walked on to the Razorback team in 1994, worked his way to being a three-year starter and was eventually named an All-American in 1998. Burlsworth was selected as the 63rd overall pick by the Indianapolis Colts in the 1999 NFL draft, but was tragically killed in a car accident 11 days later. The Burlsworth Foundation was created in his memory and supports the physical and spiritual needs of children, in particular those children that have limited opportunities.